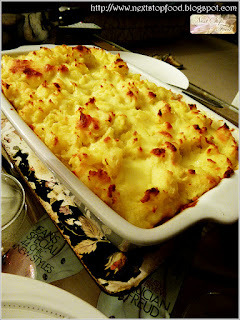 Next Stop: Food | Food Blogger located in Sydney Australia: Home - "Traditional Fish Pie"
Home - "Traditional Fish Pie"
Candice and I went to Cassie's home to finalize what we are going to sell in Bondi Markets and being a foodies gathering - of course there will be food! And what's better to eat than pies during the cold nights? I didn't really feel like eating so much meat at night so I did some research at my home recipe "library" and found this recipe ! We made this pie with teamwork with Cassie making the fish mixture, Candice boiling the eggs and I did the potato. I had to dice the cheese because Cassie's grater was hiding from us. 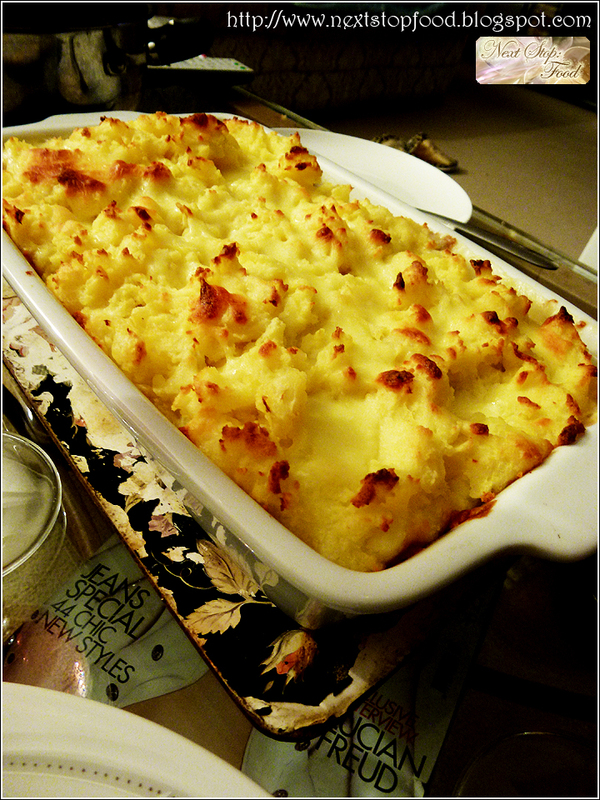 Fish Pie ready to be eaten! The recipe is supposedly for 4 people, but if you have other food, it's more than enough for 4 people so it can become your lunch the next day (Candice, Cassie and my sister said that it still tasted great the next day). This is a heartwarming recipe that is easy to follow - hope you will enjoy it as much as we did and do let us know how you went with the recipe ! Note: We used Vitasoy's Organic High-Fiber Soymilk instead of milk because of health reasons and it tasted perfectly fine - there's no soy taste at all! 1. Place fish in a shallow frying pan, pour over 300ml of milk and add onion. Season with salt and pepper. Bring to boil and simmer for 8-10 minutes until the fish is cooked. 2. Remove fish with a slotted spoon and place in a 1.4 litre baking dish. Strain the remaining cooking liquid and reserve for later use. 3. 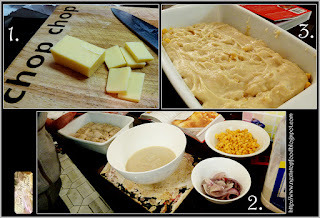 Boil the potatoes until soft, then mash with 40g butter, 3 tablespoons for the remaining milk and 30g of cheese (the cheese is optional if you are not a big fan of cheese). Season with salt. 4. Arrange the quartered eggs on top of the dish and scatter over the sweet corn. 5. Make the roux by melting the remaining 60g of butter in a saucepan, stir in the flour and cook gently for 1 minute, stirring constantly. Whisk the reserved liquid from Step 1 and the remaining milk (around 150ml) and cook for approximately 2 minutes or until it thickens. Pour the roux over the fish mixture. 6. Spread the mashed potato over the fish mixture and sprinkle the remaining 70g cheese.